A look at a popular sports website article, the related comment section and the Katherine Webb situation is not a pleasant experience. 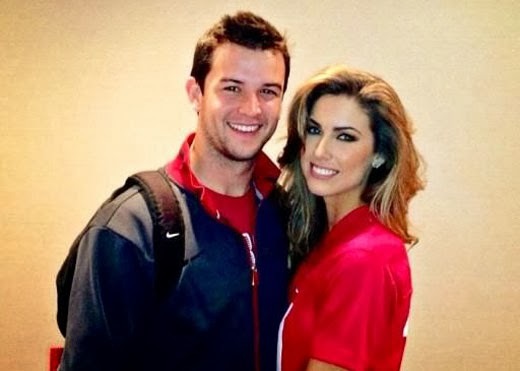 In a brilliant, cutting, journalistic masterpiece the site Bleacher Report brings us the vital report, ‘’Katherine Webb Says She's 'Nervous' About Iron Bowl Game’’. Earth shattering stuff. Sarcasm aside, this is a reflection of two topics. This is what Webb has to look forward to the rest of her life, and secondly, yes, this is the state of Sports ‘journalism’ in the United States. 200-400 word ‘articles’ with ridiculously inane headlines, an excuse to publish a few pictures and catchy captions, fodder for the comments section. And boy oh boy does the Bleacher Report comment section deliver, as always. Let’s just say a trip to the depths of a Bleacher Report article comment section is something that future generations will probably study in terms of the depths of human stupidity. A more moronic, monosyllabic and ignorant place you shall never find. This ‘article’ brought out the best in Alabama football fans (click the image to view the comments but be warned, some are offensive). In a way, you can’t blame them, this is the way they are led by the super media powers that be. This is what they are fed, and this is what they are reacting to. In January of this year I suggested that the blatant objectification on television of Webb was sexist and frankly kind of misogynistic. Some people liked the article, plenty hated it, and it generated reams of hate mail and aggressive comments from readers who called me everything from an idiot to a liberal to a liberal idiot and plenty more I won’t repeat here. College football generates the wildest, most angry of responses from its fan base. (click the image to view the comment but be warned, it is offensive). Let's call a spade a spade here, Bleacher Report may try and portray itself as a sports website, but really it is just a portal for trolls to say offensive things. If they want to argue that fact, well you can just point toward any of their moderated comment sections, which are all basically as bad as the above. Back to Webb for a second. As we said, this is her future. Basically a punchline to a stupid story. It has been a year, and it doesn’t appear as if Brent Musburger’s swarthy, scum-bag, salacious comments have got her anywhere really. No career rocket blast appears to have occurred, Instead Webb will continue to be fodder for the likes of Bleacher Report. It was suggested by some back in January that Webb herself was okay with Brent Musburger’s comments, and that she viewed it as a launching pad for her career. It would be interesting to talk to her in a couple of years, after a few more thousand ugly, sexist and misogynistic comment sections get their hands on her, to see if she still felt that Brent Musburger basically salivating over her on National TV was really a porgressive vehicle for her career. At the end of the day, this is where we are at. Idiotic articles, ugly, aggressive comments sections and sexism in mainstream US sporting media unchecked. If only some of the billions of dollars generated by College Football in the USA were spent on, you know, education. There's a caption in here somewhere..